Hello, everybody! We have an old friend back with us today. Dawn Crandall is celebrating the release of her Everstone Chronicles books in paperback this year! Let's get this interview started! I'm married and live in north eastern Indiana. I have three cats and a baby boy. And I have ADD. I started writing The Hesitant Heiress in January of 2010. I'd never written much, but I knew I would someday write a novel. It ultimately took my husband finding out about it to get me to actually do it. He encouraged me to stay home and write, so I finally did. In 2011, I went to my first American Christian Fiction Writers conference and signed with my literary agent, Joyce Hart, about a month later. I'd only just barely finished The Hesitant Heiress at that point. The year after that, while my one and only proposal made the rounds with publishers, I wrote The Bound Heart, which semi-finaled in the 2012 ACFW Genesis Contest. The next year after that, my proposal was still actively in submission, but because my agent believed it would eventually sell, I started the third book in the series, The Captive Imposter. I quickly wrote the rough draft (which I don't usually do) so I could enter it into the 2013 ACFW Genesis Contest. The Captive Imposter and The Hesitant Heiress both semi-finaled that year, and The Captive Imposter ended up finaling in the Romantic Suspense category. Soon after that, I received my three book contract from Whitaker House--one that would have my series release rather quickly (since the series was almost completely written) every three months as as eBooks... and then later as paperbacks... which is happening this fall. It's been a crazy year, plus I had my first baby during all this! All three books released within the first year of his life! So far, these three books in The Everstone Chronicles series are the only three books I've written. I have a fourth novel out on submission with my literary agent, and it's all ready to be fully written once I get the go ahead. Right now, it's been 13 months since The Hesitant Heiress debuted, and it has fortunately been a great success! It has won two awards through chapters of Romance Writers of America, 2015 The Gayle Wilson Award of Excellence and the 2015 Write Touch Readers' Award. And it is currently a 2015 ACFW Carol Award Finalist! It was also announced last week that The Bound Heart has won an award as well, the 2015 Laurel Award from Clash of the Titles! Even though I now have an 18 month old baby boy... I am still committed to writing. I just have to do it a little differently now that my first and only three manuscripts have been published! Now it's all about pitching ideas and seeing if any publisher is interested in publishing them. I have too many favorites! This is just one of them, and one that I try to live out every day. The Hesitant Heiress – NOW AVAILABLE IN PAPERBACK! Yay! After being unjustly expelled from the Boston Conservatory of Music, Amaryllis Brigham sees her dreams of founding a music academy in her hometown of Seattle, Washington, disappearing before her very eyes. Now, the only way to achieve her goal comes with high stakes for someone set on avoiding men as much as possible: Marry within the year to inherit the immense fortune of her estranged grandmother. Amaryllis reluctantly moves in to her aunt's Boston home and rubs shoulders with fashionable society. Despite her own misgivings, she soon finds herself quickly falling in love with the most unlikely of men, Nathan Everstone, the envy of every eligible female, whose father has haunted her dreams for the decade following her mother's tragic death. However, Nathan turns out to be much more than he seems...and everything she never knew she wanted. But can she ever really trust an Everstone man? Dawn Crandall is a graduate of Taylor University with a degree in Christian Education, and a former bookseller at Barnes & Noble. Dawn is represented by Joyce Hart of Hartline Literary and is a member of Romance Writers of America, American Christian Fiction Writers, secretary for the Indiana ACFW Chapter (Hoosier Ink), and associate member of the Great Lakes ACFW Chapter. She can be found online at www.dawncrandall.blogspot.com and www.facebook.com/dawncrandallwritesfirst. 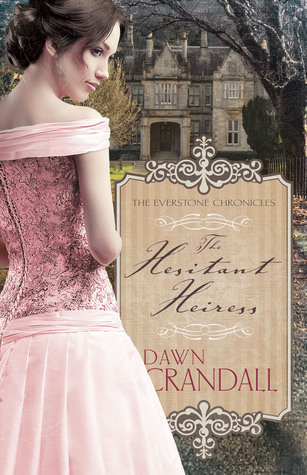 In honor of the release of her books in paperback, Dawn is giving away 5 copies of "The Hesitant Heiress!" Just fill out the Rafflecopter entry form below to put your name in for one of these great books! And for any Goodreads friends out there, she's having a BONUS GIVEAWAY over on Goodreads. Check out the link below the Rafflecopter form to enter! God bless and see y'all next week! Giveaway ends September 29, 2015. For her own protection following the murder of her brother Will, hotel heiress Estella Everstone assumes the alias of Elle Stoneburner and takes a job as companion to an elderly widow. Never did she imagine that her position would lead her back to her beloved Everston, a picturesque resort property tucked away in the rugged mountains of Maine. Living below her station in a guise of anonymity has its struggles, but her spirits are buoyed by a newfound friendship with the hotel manager, Dexter Blakeley. And his distaste for the spoiled socialites who frequent his hotel causes her to take a close look at her own priorities and past lifestyle. When Estella finds herself in need of help, Dexter comes to the rescue with an offer of employment she can't refuse. As the two interact and open up to each other, Estella feels a growing attraction to Dexter; and increasing discomfort over concealing her identity. Yet, in spite of the false pretense she's putting forth, she's never felt freer to be herself than in his presence. But will he still love her when he learns the truth about who she is? I really enjoyed the third installment of The Everstone Chronicles. This story is told in the voice of Estella Everstone, a character we’ve met in the previous two books. I wasn't sure how I’d be able to relate to her, but my worries were in vain; the author brought her to life beautifully. I connected strongly with her and thought her motivations were believable. I really enjoyed watching her grow from a childish socialite to a strong and mature woman. Dexter Blakeley is an excellent hero; starting out gruff but winning over Estella (and the reader) with his charm, character, and humility as the story goes on. His devotion to his family was especially likeable. The romance between the two was sweet and completely captivating. I loved the sweet, pure quality of it. As usual, the author brings in a few of the previous characters and it was exciting to see them growing and becoming better people. I truly enjoyed this entire series, so while this is a stand-alone story, I recommend reading the other two books as well. 5 stars for a lovely historical novel! Dawn has generously offered the winner of this giveaway their choice of an e-book copy of The Hesitant Heiress, The Bound Heart, or The Captive Imposter. Just fill out the Giveaway Tools form below to get started! Giveaway ends 4/21/15. Thanks for visiting and God bless! One accidental kiss from Lawry Hampton. That was all it took to throw Meredyth Summercourt's world upside-down. Determined to marry the ever-elusive Vance Everstone, she simply doesn't have the time or the desire to fall for her best friend. But with Vance out of the country, and with Lawry at her side nearly every day, teaching her what the world is like through the eyes of a little orphan girl named Wynn--Meredyth can't deny that what's holding her to Vance is nothing more than a desire to redeem herself from her past. Will she marry Vance once he returns from Europe? Or will she be strong enough to break free from the tangled web she's convinced she deserves, and accept that God's plan for her life includes redemption...and, quite possibly, Lawry Hampton? This is my favorite book of the series so far. I enjoyed “The Hesitant Heiress”, but “The Bound Heart” was a very powerful story, told on a much deeper level. This story follows Meredyth Summercourt, one of the characters introduced in the previous book. Her journey to redemption was a roller coaster of emotions, both heartbreaking and gloriously happy. Let's just say that she earned her Happily Ever After. :) I was hooked from the first chapter. Highly recommended.